I made a double chocolate cake, shaped like a fish. I made this cake for my boyfriend’s 30th birthday. He loves fishing and earlier that month he caught a huge bass, which inspired me to make him a Bass homemade catch of the day fish cake. I started with a two layered heart shape cake. I used the boxed mix of chocolate cake and added two large packs of pudding and 6 eggs to make it extra moist and thick. I used plain white vanilla frosting to cover the cake and then made a small back of blue frosting. I used the blue frosting to give the look of water under the fish. I used a butter knife to lift the frosting to look like disrupted water. I then made another two layer cake for the fish. I then cut the cake in half and staked it on top of it self, to make a smaller but taller cake. Then I used a knife to sculpt it into the shape of the fish. I frosted the cake in white frosting on a separate plate. I also used green pray frosting on the top half of the fish. To keep the belly of the fish white I used a piece of paper to cover what I did not want green. For an added touch I sprinkled green edible sparkle sprinkles on the top of the fish and white sparkle sprinkles on the bottom of the fish. I also used blue sprinkles for the water. I added the fish to the top of the water cake. For the eyes and fins I cut out shapes from fondant and let them cook in the refrigerator. when they were cold enough to keep their shape, I sprayed them with the green frosting and positioned them on the cake. 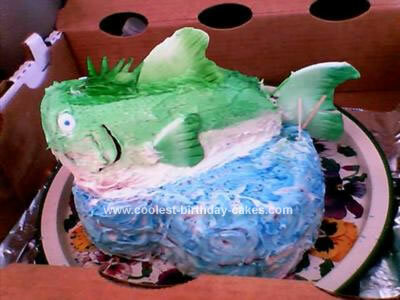 An added tip: place wooden pegs through the fish and the bottom cake so it doesn’t move around. And if you are traveling with the cake keep any detail that will be standing up like the fins and put them on after you get to your destination. If the car is warm they will start to droop. Hope this helped bring out some creative thoughts! Good Luck!